Synchronized bottle rocket launch by Uncle Glenn Lewis, Phil, Jason, Luke and Tyler. A shot overlooking Kandern at midnight. Happy New Year everyone. The fireworks in this picture are set off privately in the streets of our village. You can buy fireworks (bottle rockets, firecrackers, etc.) in the grocery stores here just prior to New Years Eve. And best of all...IT'S LEGAL. What a blast - literally. It was doubly fun this year when a neighbor's shrubbery caught on fire from a stray firework and the volunteer fire department showed up in the middle of everything. It was sure exciting. This is Tyler and some of his friends. Phil Wiebe to the left of Tyler has been Ty's friend since first grade. Jason Bateman and Dan Beck on the right were senior leaders of Tyler and Phil when both guys were in junior high. Jeff and Dan are both in college, now back in Kandern checking on Phil and Ty. This stuff is awesome. This is a swiss dessert that is only available at this time of year for about 4 weeks ahead of the carnivale season. It is called "Fasnachtschüechli" in swiss german. It's a simple thing - thin fried batter with lots of powdered sugar on top. I can remember my swiss grandma making this for us when we were kids. I remember how funny it was to hear her say the name "fasnachtschüechli" - go ahead and try to say it yourself and see if you don't laugh too. It's a mouthful in more ways than one. To my brothers and sisters and mom: do you remember this treat that grandma made for us? It is a swiss tradition and available all over the country. Don't you want to try some? It's good! BFA alum Andrea Peck and Ian McClurg got married here in Kandern. It was so good to see two young people in love with each other, in love with God, commit to a life together. It was very special to for us to be there. Christmas group shot. Backrow: Tim, Doris Frank, Luke, Jesse Frank, Sharla Wilcox, Ben Wilcox, Melody Olson, Travis Olson. Front Row: Sandee, Tyler, Mr and Mrs. Wilcox, Annalisa Olson, Tony Olson, Tyler Olson, Karin Olson. Meier sisters - Sandee Shuman and Doris Frank. "Uncle Jesse, I would play THAT card." Tyler Olson says to Great-Uncle Jesse. White Elephant gift giving fun. Sandee, Jesse and Doris Frank. The guys playing a LONG game of "Settlers". Sandee, Tyler, Luke, and Tim in Kandern, Germany. Click on the picture for a larger view. Dinner with our extended family at the Olson's house. Shumans, Wilcox, Wilcox, and Franks. Here we are for the traditional "white elephant" gift exchange, but the white elephant was a nice gift - not unwanted junk. What year is this?? I'm having a flashback to my childhood. What a great game! Hey, look Tyler! No memory chips, no internet connection, no re-booting. Just pure analog gaming at its finest. Christmas Eve at the Shuman's house. One of the TV channels was broadcasting Christmas songs and nothing but a fireplace scene. Nice. Boys playing FIFA 07 - soccer on Xbox. Luke and Sandee share Christmas joy. This is a great "old school" gift. I had to explain to the boys that this was an analog game that involved no computers, memory, or internet. This is what teenage boys do when schools out...get a friend over and play Xbox. That's Joel Wilson with the guys. Tyler, Sandee and Luke playing a Christmas tune on the "pipes" - a fun group activity. The pipes are literally just 1/2 inch galvanized pipes. You tap them with extra long spikes (nails). Everyone has a numbered pipe and you stike your pipe when you are supposed to in the song. This is part of the group of C&MA missionaries on staff at BFA. "The Pipe Choir". Look who's six months old. Go ahead and say it, "She's so CUTE!" Do you know what the round clumps are in these trees where we live? Can you take a guess? Here's a couple of hints...the clumps are parasitic plants that live off of the host tree. They are also part of a special tradition at Christmas time. Enter your guess by clicking on the comment button below. Do you know about the other Iraq? Did you know that there is a part of Iraq that is genuinely thankful for help from the West? Visit www.theotheriraq.com and watch a couple of the videos there. They will encourage you. I can confirm that good things are happening in the north of Iraq - now known as "Iraqi Kurdistan". I have friends who have been there and saw things first hand. Several of our BFA staff members have gone to northern Iraq to help a Christian school there called "Classical School of the Medes." To learn more about this school for the children of northern Iraq go to www.csmedes.org. At www.csmedes.org, click on the "Philosophy" tab and see what you think. It's amazing. This is KD's latest trick. Crawling. Luke (wearing Shuman Plumbing Hat) and KD. It's KD's sixth month birthday today! Tim and KD trying to get a toy that went under the TV cabinet. These pictures are a few weeks late. This was banquet night at bfa. 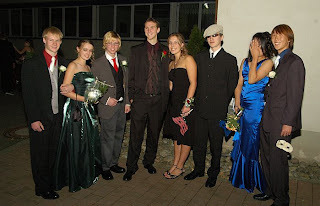 This is a picture of some senior students with their dates. Notice Luke. 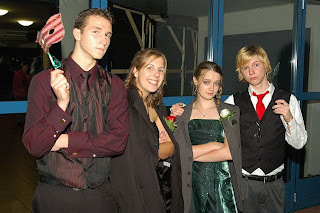 Luke and Billy (Luke's best friend) with their banquet dates Julie and Emily. 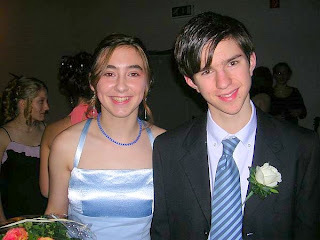 Tyler and his invitee (date) Verity. A fine looking couple.